Christine Blasey Ford alleges that nearly 40 years ago Brett Kavanaugh, who was 17 years old at the time, tried to sexually assault her. Alcohol was involved; Kavanaugh was reportedly a drunken mess. Christmas has come early for Democrats. They’re going to Me Too Kavanaugh, score points with their liberal base, and whip up college-educated urban women in times for the 2018 midterms, right? The GOP will buckle under the pressure, Susan Collins, Lisa Murkowski, and Jeff Flake, will break ranks. Flake being the most key since he’s the GOP’s winning vote on Judiciary. None of that is happening. The GOP is united. Flake said if Ford is a no-show for the hearing the committee is setting aside to deal with these allegation, postponing the original committee vote on the nomination, which was slated for today (Flake supported this), then he’s going to back his party’s push to get Kavanaugh through. It’s easy. Ford can’t remember who threw the party, why they were having the party, or how she got there. Three witnesses she identified said they have no recollection of the incident, nor are they sure there was even a party. It’s shoddy. It’s thin. It’s unprovable. It has a long shelf life, but the GOP sees right through this. Democrats want an FBI investigation. Why? There’s no federal crime. As Ed noted over at Hot Air, at most, this is an attempted aggravated assault charge, a state charge whose statute of limitations has long expired. The FBI even said this is a political issue, not one relating to law enforcement; they’re steering clear. And here’s where Sen. Chuck Grassley (R-IA), Senate Judiciary Committee chair, delivers the deathblow to this absurd pivot from the Left. They can’t force an executive branch entity to conduct a politically motived investigation and bypassing their constitutionally prescribed duty because Democrats don’t like someone. “We have no power to commandeer an executive branch agency into conducting our due diligence. 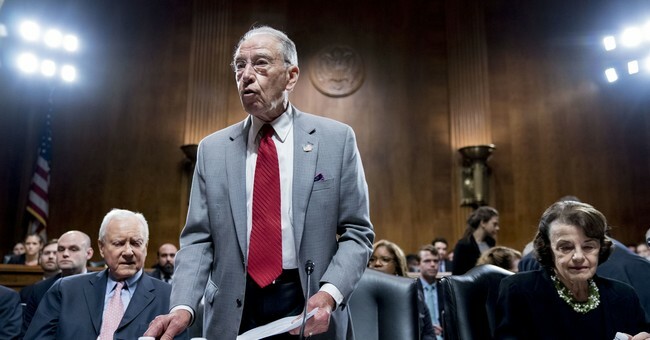 The job of assessing and investigating a nominee's qualifications in order to decide whether to consent to the nomination is ours, and ours alone,” Grassley said in the letter. Grassley has invited Democrats to participate in the Committee’s investigation into allegations involving Judge Brett Kavanaugh brought to Ranking Member Feinstein’s attention in July, but only shared with the rest of the Judiciary Committee after Feinstein passed them off to the FBI last week.